Irrespective of the size of our stockpile, do we ever stop pining for more ?!!! As our stock grows larger & more diverse, greater the risk of messes, misses, & mix-ups … of losing track. 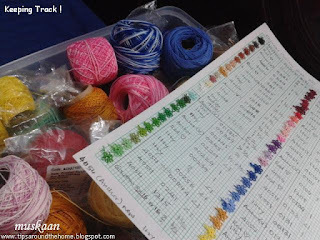 I finally heeded the clarion call of my thread stock as part of our monthly Pinterest Challenge – my stockPINing ! Discovering new shades & the ease of choice ! It all started last month, with my cross stitch bookmarks. With all skeins cramped into one box, & the patterns needing many colours, I found myself spreading out the skeins on the bed – not a good sight at all ! First sorted skeins according to colours. 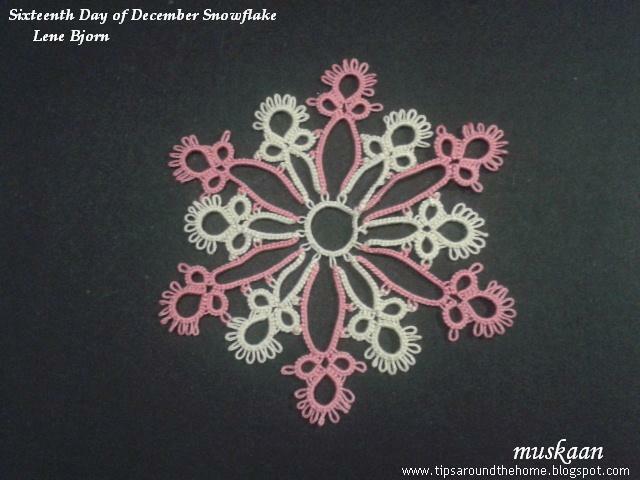 Then simply tied a knot at tip of each strand, cut off a very short length & glued it to the page, along with details. Slow-going, but with immediate results. 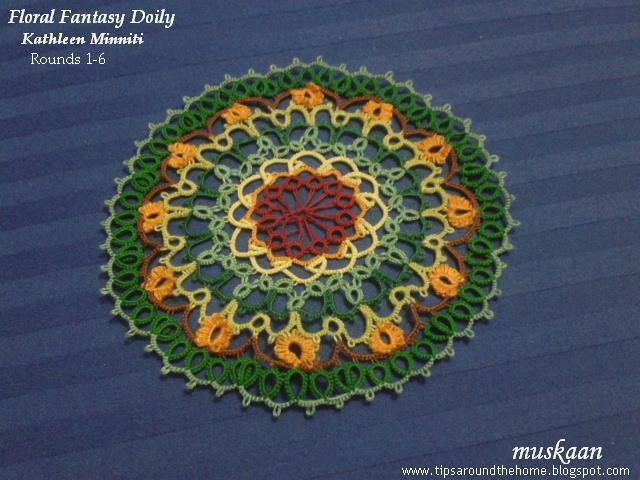 Not only did it help in choosing colours for bookmarks, but for the Floral Fantasy Doily ! 2 shades of light green were Very similar (2nd coloumn); but I could locate the exact shade I wanted because of the catalogue. Discovering the mystery of the zero ! For the last 30 years, I have used only Anchor MCC (from Madura Coats), bought at various shops & now online stores. As my stash grew, it always perplexed me that some threads seemed thicker than others, despite the size number being same. Also the shade numbers – some had a single 0 before them, some had two zeroes, while many of my vintage balls didn’t have any 0 before the shade number. I put it down to different stores, different years/decades, & so on. In fact that is how I entered in the catalogue. TILL the shade column & the tatting alongside threw up this interesting fact : the 0 digit represents the thickness within that size !!!!! Now I know which balls can be used together in same project. Also noticed that the shape of ball with single 0 is different from the one with 00 (which is squatter with thicker thread) ! Discovering doodads & forgotten ideas ! I tatted little 5-petalled flowers to glue for reference. 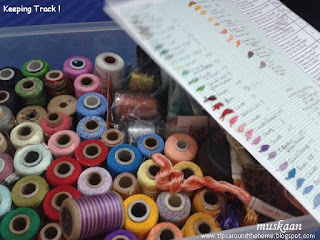 And devised this to speed things up (instead of cataloguing each colour individually) – pull out a short length of thread from ball & finger-tat the ring with thread still attached to ball. When all were tatted, I simply had to snip off the flower from each ball & glue to page, adding details. 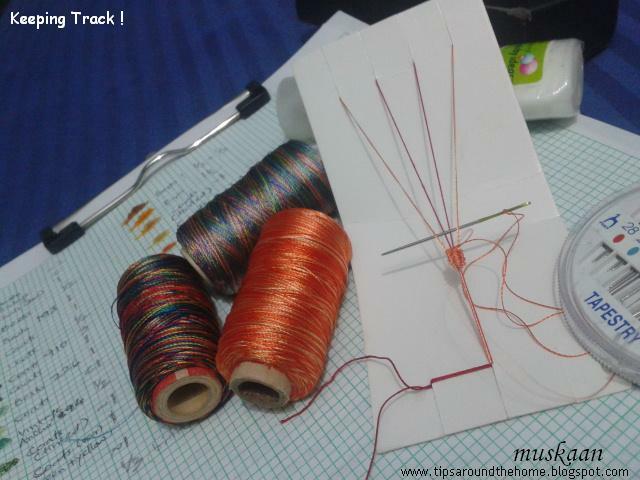 I had totally forgotten about spools of metallic threads including gold & silver ! These are unmarked, so I have no idea of the brand. 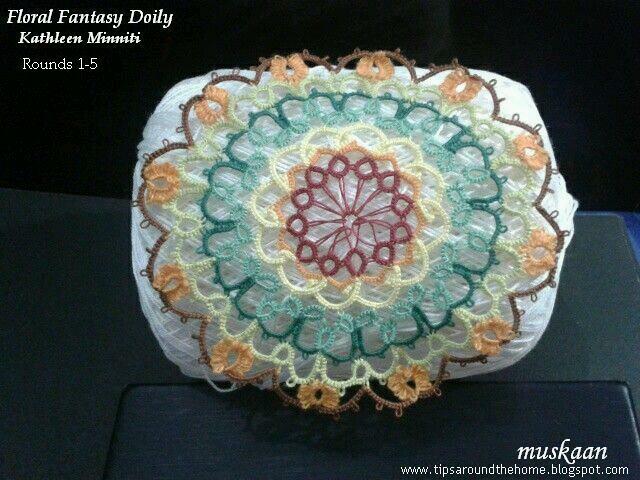 But even more amazing & nostalgic were my Mom’s machine embroidery silk threads in wooden spools. They date back to at least the late 1940s, early 50s !!! It was mesmerizing watching her skillfully maneuver the embroidery hoop with her left hand at a hand crank sewing machine ! I can’t do with 2 hands on my electric pedal machine with it’s multiple decorative stitch options ! 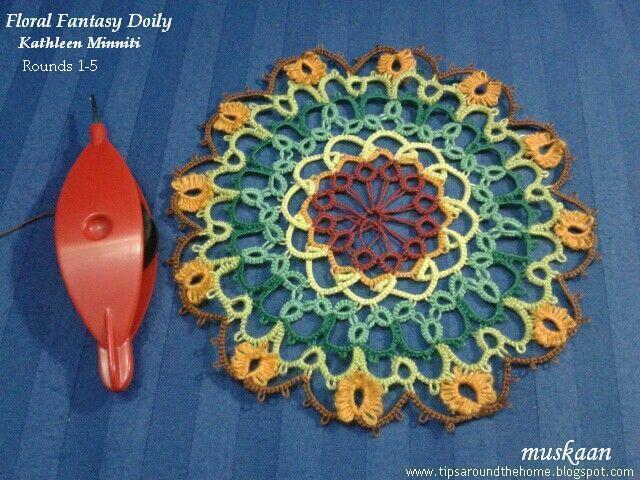 Strands of these threads were difficult to glue down, hence practiced some Hanging Cluny Leaves to display the colours better. A few got stuck while pulling, thus disfiguring their shape. These are big balls taking up much space. Hence, I used to store them in the closet, in bags, not in transparent boxes. After I’d completed the table cloth edging, I was under the impression that the size 10 variegated blue ball was all over. So imagine my delight when I discovered 1 entire, unused ball ! Now even the balls are stored in different places, a quick reference to the catalogue will tell me that I do have more ! How useful a clue is that ?! 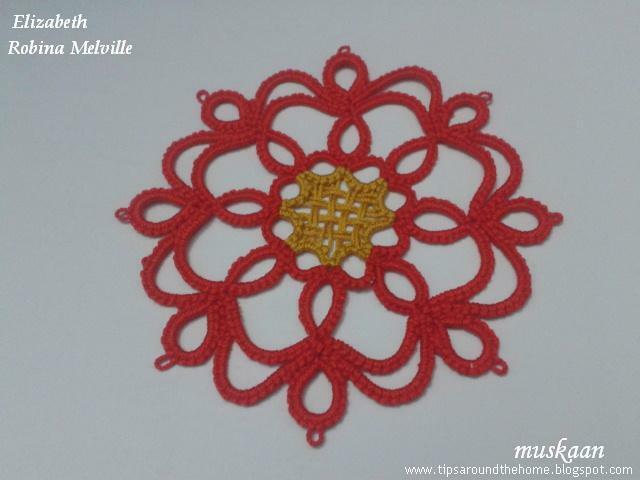 For the first time last year, I had ordered in some gold & silver beads & jewelry findings to use in my tatting (and they worked beautifully). All the rest of my bead stash (mostly pearls, transparent plastic, & some wooden beads) & some rhinestones, sequins, etc. were stuff I took off discarded decorations, mementos, dress materials, etc. Couldn’t bring myself to throw out the colourful embellishments. But while some of these were good, some were irregular in shape & hole size, making them difficult to use … which was fine since I didn’t tat much with beads. 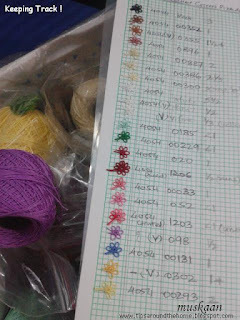 Seen in the pic is a snipping of the invoice with relevant details of my latest bead acquisition and a sampling of my stash…. 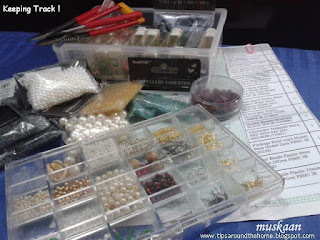 I still have to prepare a proper page with new & old bead samples taped & buy a larger bead container. 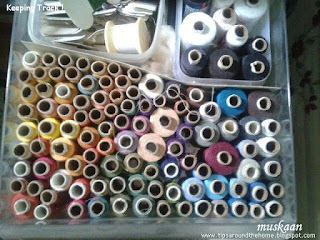 These are old pics (top view with open drawer & side view of entire organizer) of segregated sewing threads, organized for many years now. They are in an A4 size file cabinet with 4 transparent pull-out drawers from Staples. The lowermost was the perfect height for sewing thread spools ! All not-in-use reels are stored there in broad colour-groups, and can be picked out easily. 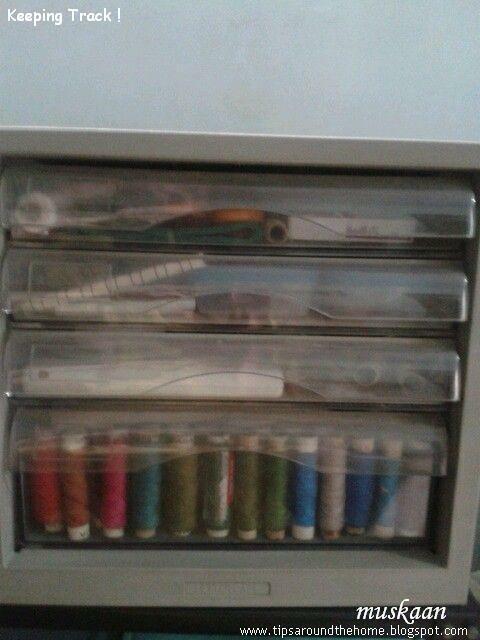 The 3 upper drawers are used for other sewing-related supplies. 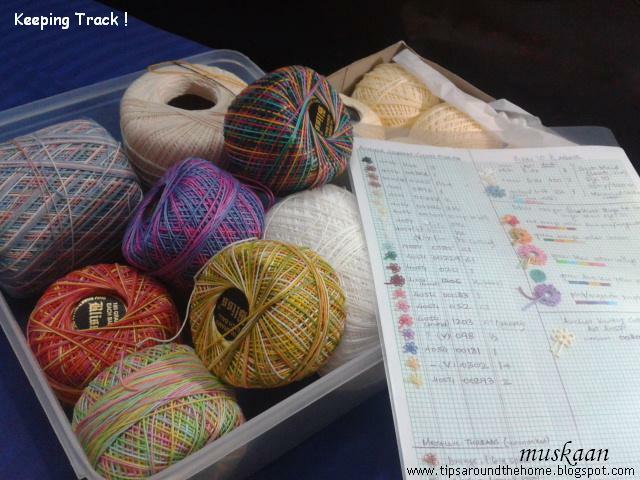 Remember these quick yarn shade samplers I made, inspired by crochet bloggers ? They did come in handy for the colourful stashbuster Memory Afghan, but how pathetic are they ?! 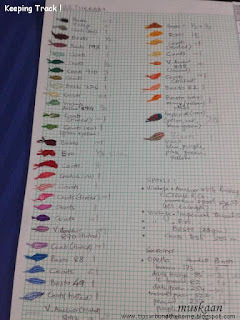 Come winter, I will sit down to prepare a proper one-page catalogue for my wool stash too. UPDATE : My wool stash is now organized (Dec, 2016)! Now if only I can catalogue my book collection. Believe me, I’ve tried many times, but new books kept getting added before I could sort them out. I have also tried to take pics on my cell phone but not every shelf is well lit. And of course my fabric stash - that is indeed a major task. 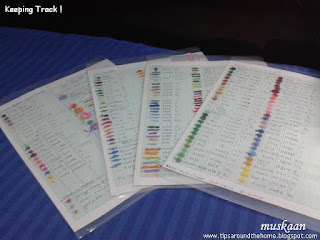 Despite all the sniggering at my spread-out stock, it was ‘his’ idea to place each sheet within a transparent sleeve ;-p Love the idea – makes them so durable despite all the handling & referring !!! These took time & patience to put together. But the advantages are so worth it, and already showing. 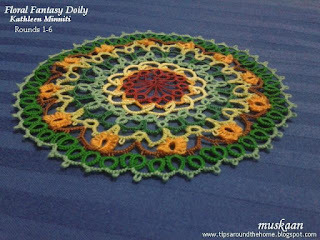 Besides, some old threads also brought back memories of embroidery, card-making, crochet, tatting projects done before my marriage. Long time ! It also brought home the fact that the quality of Anchor (Coats) threads has decreased over time - they were finer, silkier, brighter in colour before ! As usual, my pinterest challenge is merely utilitarian & boring. For a glimpse into some amazingly creative challenges, click on the names of my fellow pin chicks … they are always so delightfully inspiring ! 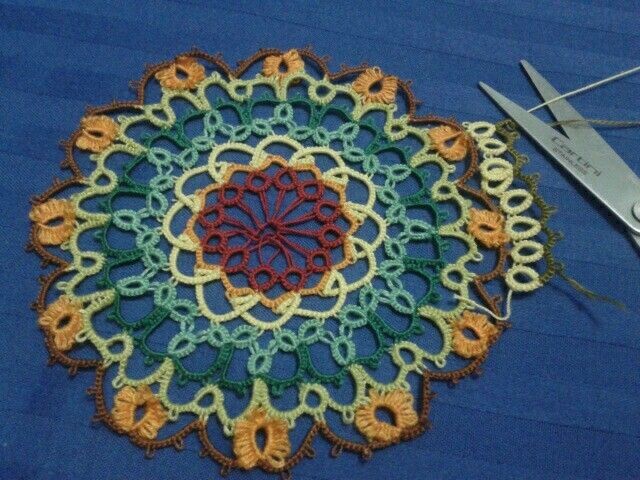 I began the round using the same yellow crochet cotton as in earlier row. But the picots were airier & distinct. Cut it off & replaced with embroidery thread to imitate the orange flowers. Very quick tat around ! Pics & details of rounds 1-6 here. Now need to figure out the next rounds. No stitch count posted yet, but before that I need to figure out how to tat the 2 rounds - probably tat them together.... let's see. Started with a SCMR and climbed out with a mock picot. Noticed too late that it had twisted while closing. Again tried to experiment with 2 colours & the reverse join really helped to switch colours/shutles. 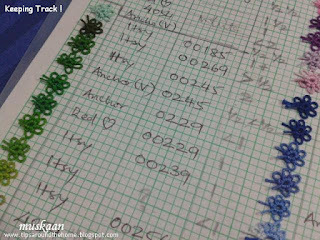 I made only the 2nd half stitch after the join, counting the join as 1st half stitch. Ball thread joins helped when connecting the arms, maintaining some symmetry with picots on each arm in each colour. 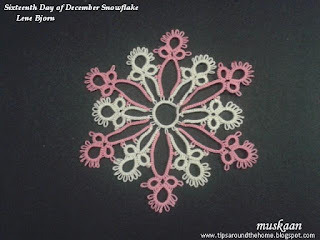 With some experience gained tatting the earlier snowflakes, especially the Day 10 snowflake, I tried to keep the picots ‘normal’. Could’ve been just a tad bit shorter still (since these become double in length when ball thread join is used). All frontside tatting in clockwise direction. 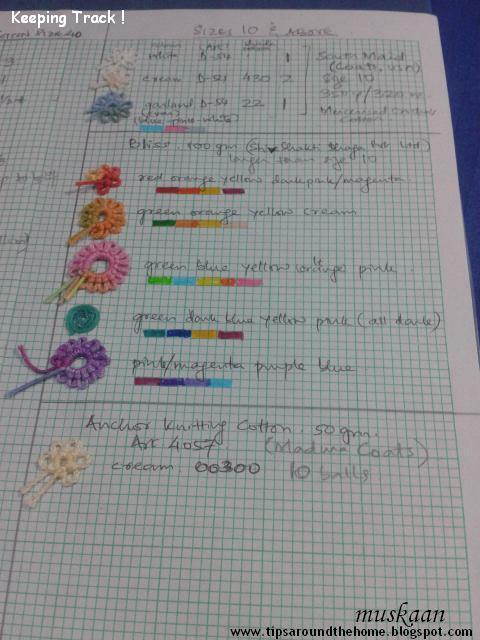 I rarely use a picot gauge for regular tatting. But this time I decided to challenge myself & used a picot gauge for the decorative picots on trefoil rings. 1st ring of the ecru trefoil is a mock ring (SCMR) in order to make a proper ball thread join. I’m not happy with my chosen colours, but these balls have to be consumed as well. 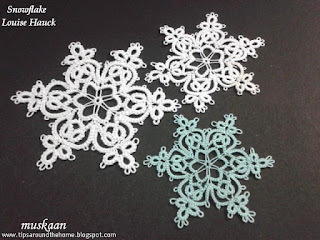 Tatting-wise, I could’ve done a lot better, too – some basic errors should’ve been avoided ! 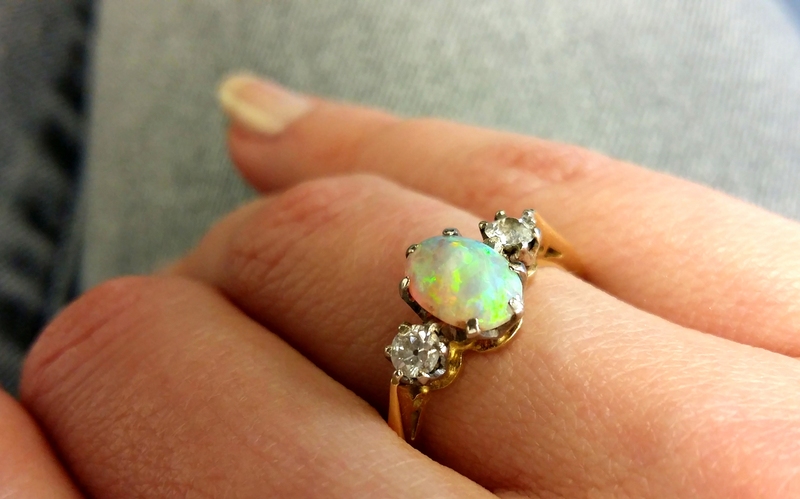 These are true rings, including the leaf. No chains or mock rings. Tip to tip, the doodle measures just over 1½”. 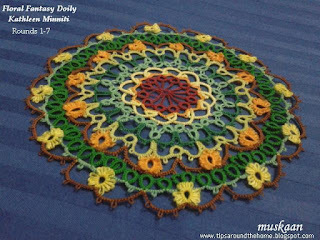 I like the pattern, especially how the arms are filled in - a breezy center with dense middle ! It is a 2 shuttle, 4 round pattern, all done in a single pass using mock picots to climb out to next round !!! 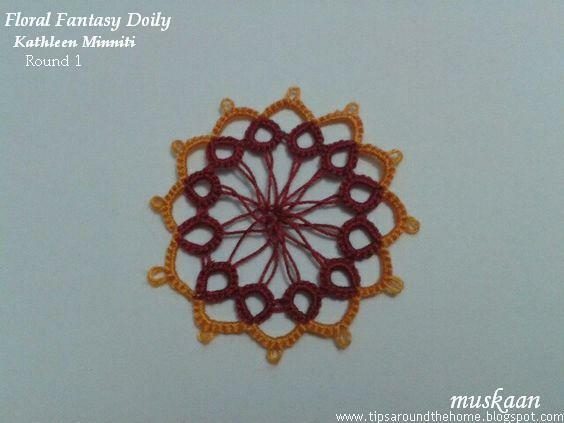 Except for one small bit (chain), all tatting is done from the frontside, moving in clockwise direction. This is the diagram, with colour-coding of each round. To download the complete 3-page pdf which includes written notation, diagram & a pictorial, click here. The pictorial collage in the pdf has fewer pictures. Hence, I am sharing pics of each round here, indicating major points of each round alongside. Climbing out with a mock picot. The long picots in this round were made with a ⅜ inch gauge held horizontally/parallel to core thread. 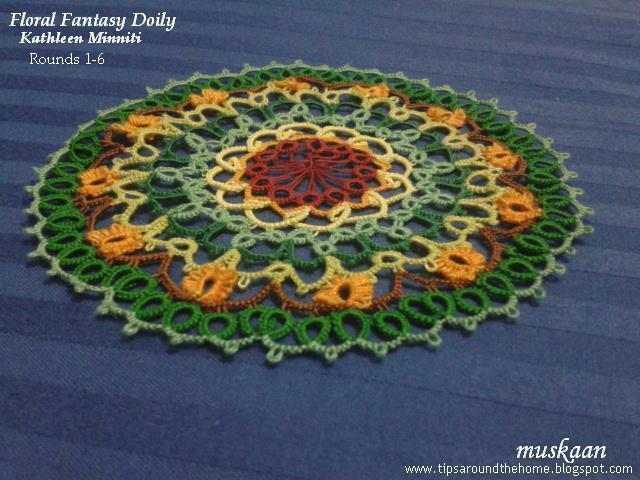 TIP : When starting the chain after mock picot, I did not make any unflipped half stitch. 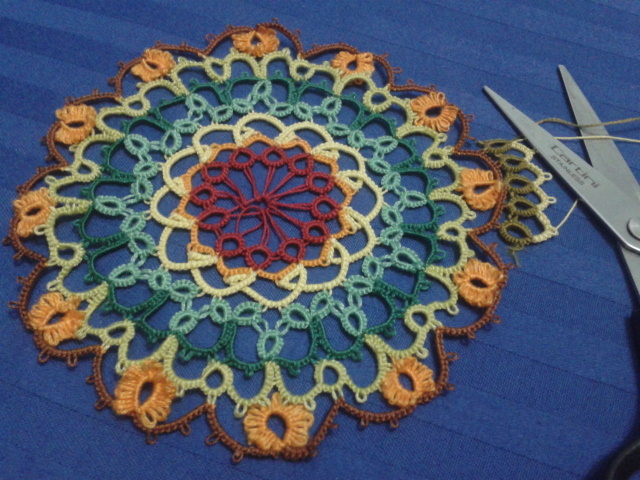 Instead, start tatting normally after leaving picot space, and while snugging the chain stitches, simply ensure that the core thread retains the picot length (see pic below). This is especially useful when working chain in another colour - no colour blip will show ! The picot at the tip of chain is a small picot, but the one at the base (after the lock join) is a normal picot. 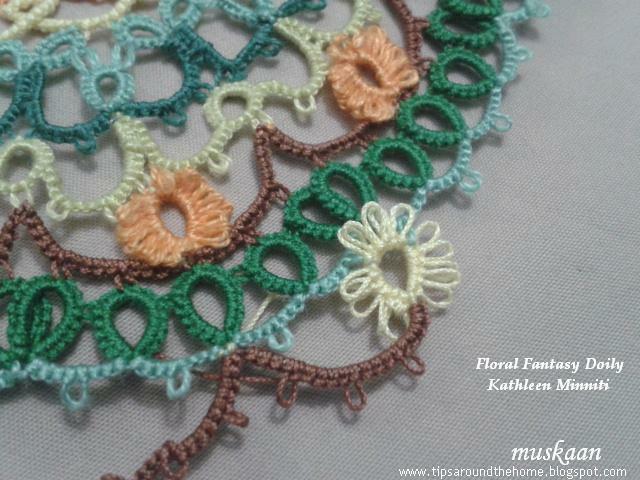 The difference in picot lengths helps to bridge the next round so that the short chains lie neatly. 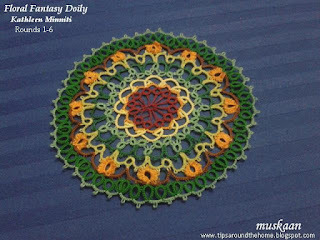 If the base picot is small, the chain tends to turn. 2 thrown rings spanned by a chain. This is the only time when we Reverse Work (RW) in the entire pattern; otherwise, it is all tatted from the front. 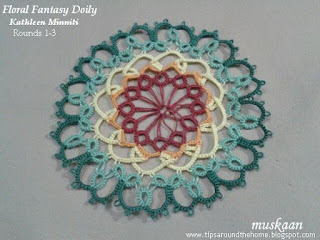 Of course, this chain can be worked in Direct Tatting using unflipped/reverse stitch. I used a Catherine Wheel Join to bring continuity to the chain, but it is optional & can be substituted with a lock join. The CWJ is not included in the stitch-count of the chains. Consider it a way to span the distance. 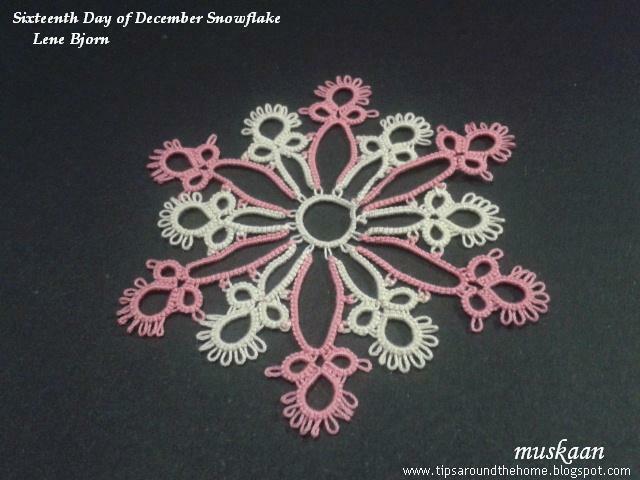 The snowflake ruffles a bit, but is easily flattened with fingers. 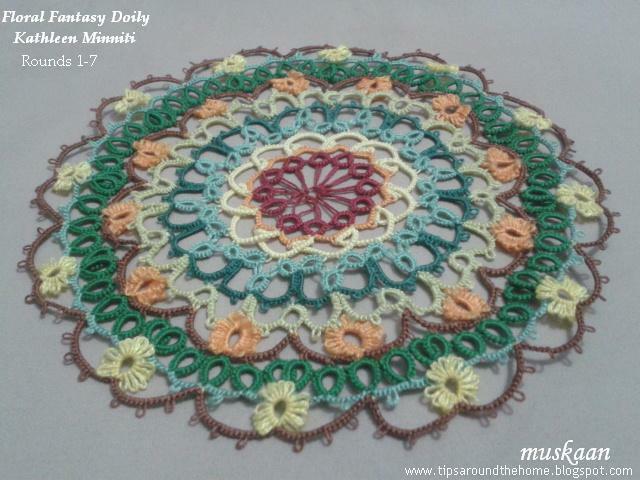 Picot lengths/sizes play a role in this piece. The Trefoil is thrown off the chains. 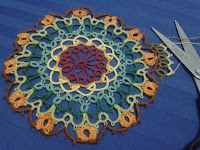 Hence, to anchor each ring, as well as the trefoil, in place, I used very small picots keeping the overall stitch-count same. These tat up very quickly & most of the thread used is from shuttle 2 since it is mostly chains & thrown rings! I used Anchor crochet cotton size 20 (white - model #2) & size 40 (white model #1 & 4054-0185 for model #3). 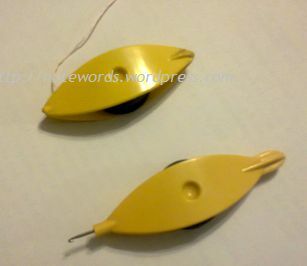 It measures 3" in size 20 & 2" in size 40. 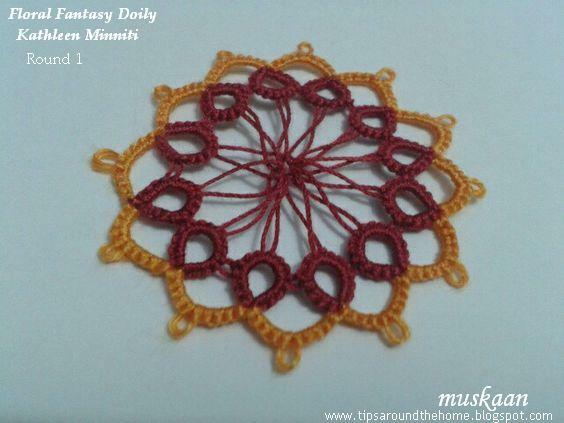 It was Rakshabandhan on the day I completed tatting, so how could I not play around, especially since my resolve to put up a rakhi bracelet pattern this year did not materialize. 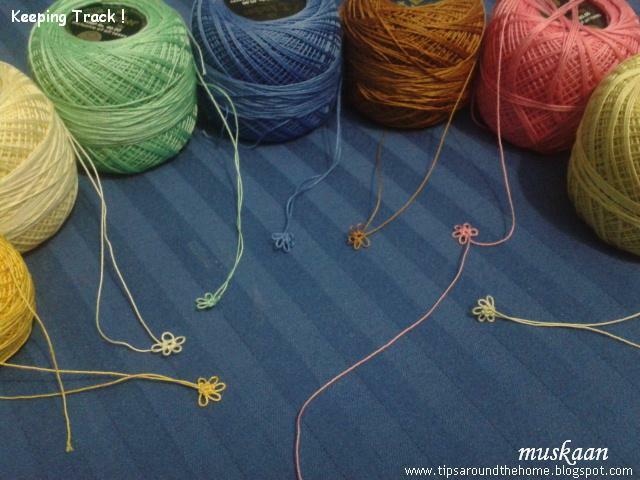 So here's a pic of how 2 snowflakes in different sizes, topped with a long-picoted ring, would work as a possible rakhi centre ... we cord/twine attached under. 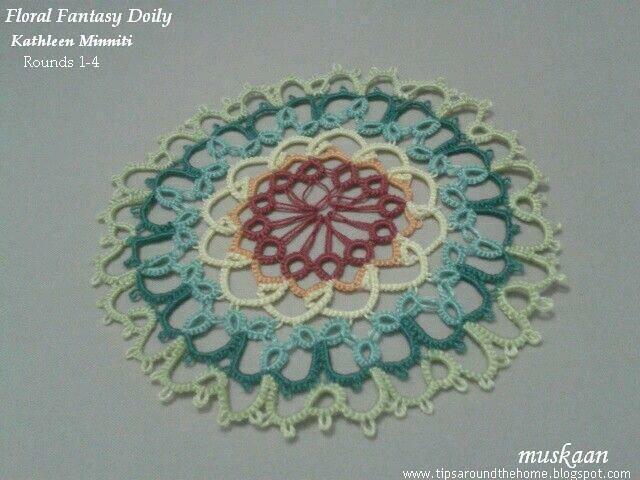 Of course, the colours are too 'icy', but the idea is use-able, don't you think ? I’ve sensed this for a long time & this medallion confirms it. Anchor Crochet Cotton that is made in India by Madura Coats is thicker than the size 20s & 40s (of any brand) that I see you tatters using. In fact, it is thicker now than the old thread I have ! Makes it very difficult to follow a pattern with long picots. This is such an elegant pattern ! Techniques I used : long picots, woven picots, split rings, thrown rings, lock join, SSSR to climb out. My first attempt failed, as I had sensed, due to difference in thread brand :-( The last ring didn’t even have any space to fit in (top right in pic) ! 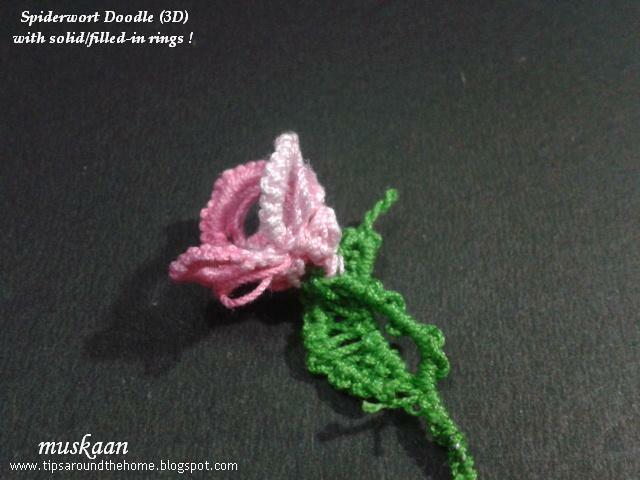 Increased the picot sizes & the 2nd attempt worked. TIP : I used a threaded tapestry needle to easily weave the picots, otherwise it was a bit fiddly in the cramped centre. For my own recollection, there many ways 2 colours can be used in 1st round & still climb out to next round without tying & cutting both threads. 1. Climb out with a SSSR in red, while hiding the yellow tail in first half of the SSSR. I had to do this, because I didn’t think ahead & I wasn’t sure what colour(s) I wanted for next round. 2. Wind 3 shuttles : Sh1 with yellow; and 2 shuttles wound CTM with red. Thus while climbing out, we hide the yellow within a split ring. This is what I could’ve done. 3. Double Core SSSR to hide the yellow within & keep the SSSR red. This, in fact, gives us the option to continue with both colours for next rounds, yet keeping the ring a single colour – either red or yellow. I had tried this for the first time here, with a slight adaptation. I absolutely Love this medallion & enjoyed tatting it. Hey, even my long chains behaved ! 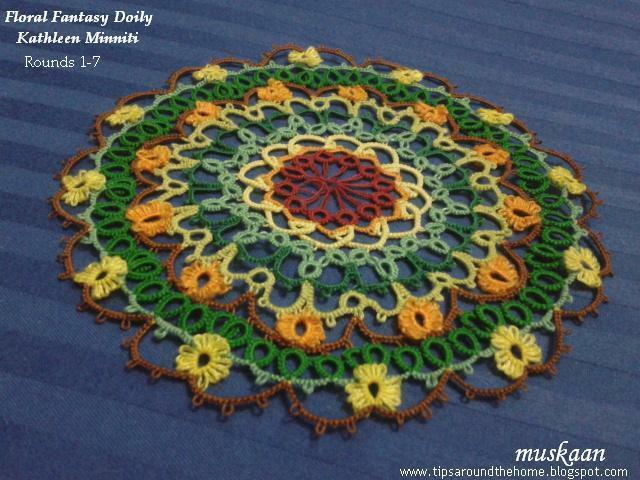 Although, I did make a mistake – a picot in one of the outer chains – an expected outcome of trying to watch the Olympics & tat. Noticed too late, so folded the picot behind & glued it. Will sew it in later. My very first attempt at woven picots was when I saw these lovely earrings by Lilas Lace. 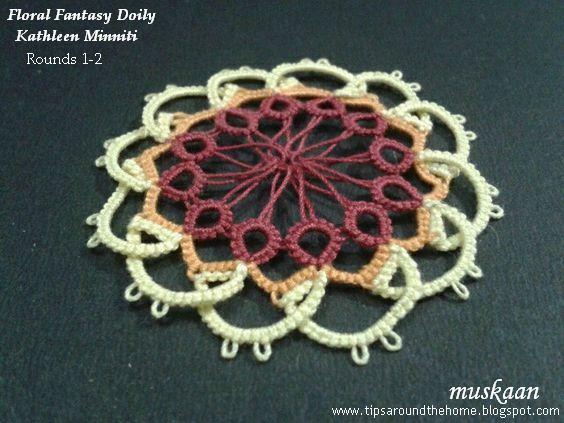 I was going through a phase of learning different picots & effects - the net kept throwing up such gorgeous tatting ! So these earrings both inspired & intrigued me & using her basic idea, I attempted to tat it. 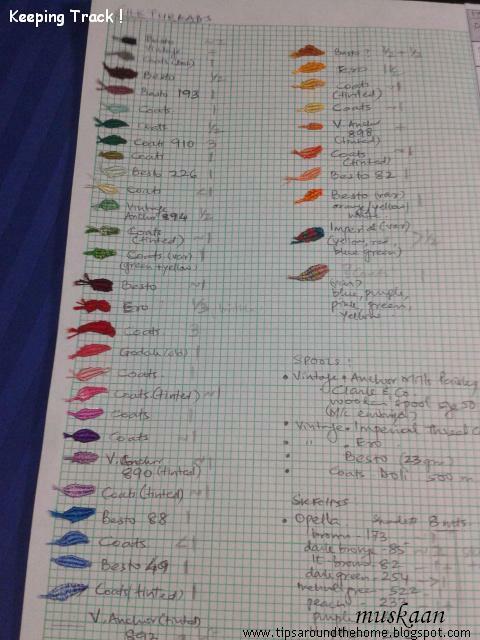 The stitchcount is my own & I included 2 colours & Josephine Rings. Didn't have findings/hooks... 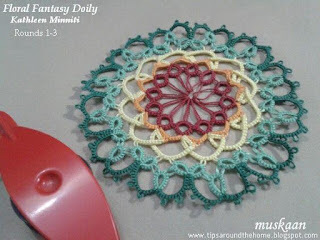 This can work as a pendant, too. This is the 'before' pic. 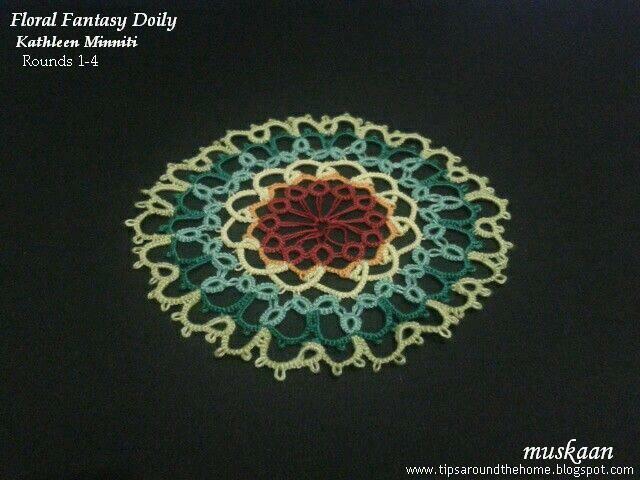 More practice with picot gauge was needed then, but blocking the piece now has helped a bit. and this one is for Michelle ! Remember this, Michelle ? A while back I had tried to duplicate the look of that tatted model in pinterest that you shared. Tried a few things in size 40, but don’t know where I’ve misplaced them. Will turn up some day. Before posting, I usually do another round of online research for resources. And guess what - Karen already Has a video of these !!! They are called Interlocking Picots (why do the tutorials turn up After I've gone through the grime ?! I need better perception & recognition). Had some thread left on the shuttles after the medallion, and quickly tatted another for this post before I forget again. It wasn’t intentional, but a lucky coincidence – the symbolic resemblance to our flag colours ! We are celebrating the 70th Independence Day on 15th & these are the colours I see all around (with the white, of course). Kathleen shared a few tatted rounds (& pattern) of this doily but a complete sketch on Craftree. 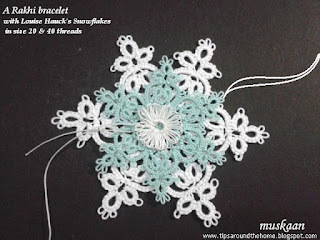 It was still a work in progress, including pattern-writing, but two features called out to me instantly & I began tatting along …So far she has shared stitch count for 6 out of the 9 rounds. Following the name & the pattern, I wanted this to be a bit colourful. 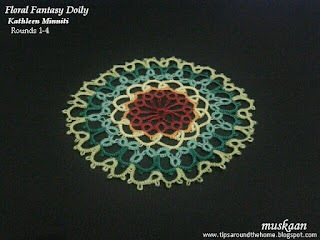 In order to increase my colour choices, I have tatted this in a combination of size 40 Anchor crochet cotton (Art 4054) & 2 strands of Anchor embroidery thread (Art 4625). Many rounds can be done with single shuttle & ball & while I used 2 shuttles for the most part, I have mentioned which rounds can be tatted with ball & shuttle. Only Rnds 1&2 were blocked before taking pics. 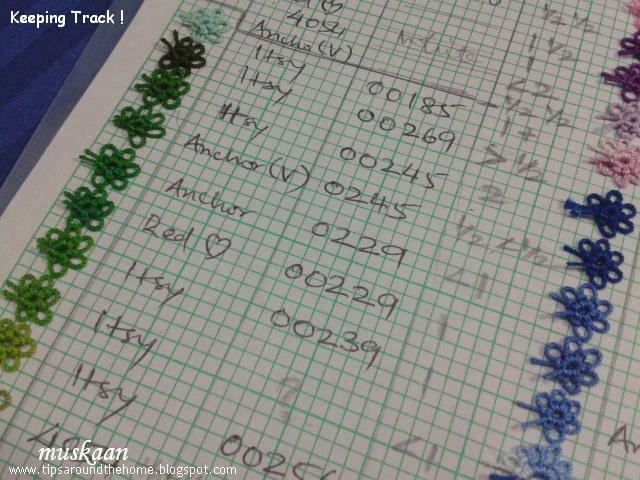 All subsequent rounds are unblocked &/or un-ironed/unpressed … will do it after completion, for the final presentation. 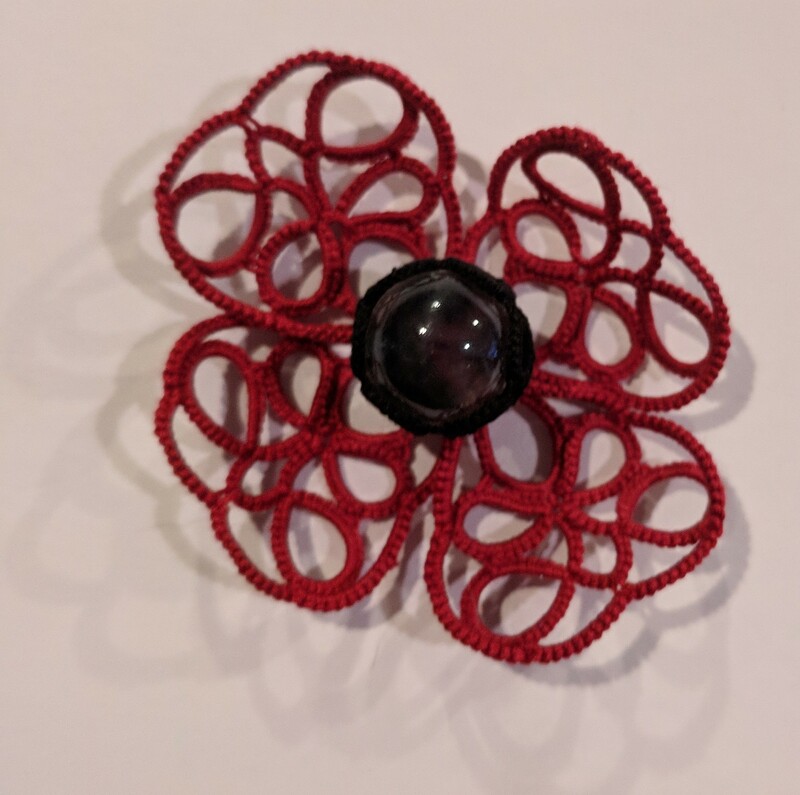 Techniques: Swirl Join, down join, directional tatting, picot gauge 3/8" for the long picots, last ring SCMR, ball & shuttle. Actually a swirl join would hold them all together, since it is a proper join. But with these very very long picots & fine thread, it became extremely difficult for me to manage. Hence, after very many failed attempts, I started the last ring as a SCMR; then cut off a length, pulled the end through all the picots, and completed the ring. This can be seen in the more open picot towards the bottom right in later pics. CTM or shuttle & ball : 4054-0293. Techniques : lock join, reverse join, RODS. Ball & shuttle CTM. I loved this overlap of the chain & chose a light colour to highlight it. TIP : Probably better to start with the ring at the LJ position. Now I had to cut off shuttle thread in the end and pull it through to the front for overlapping, before completing the last segment. Techniques : directional tatting, long picots, down join, ball & shuttle. 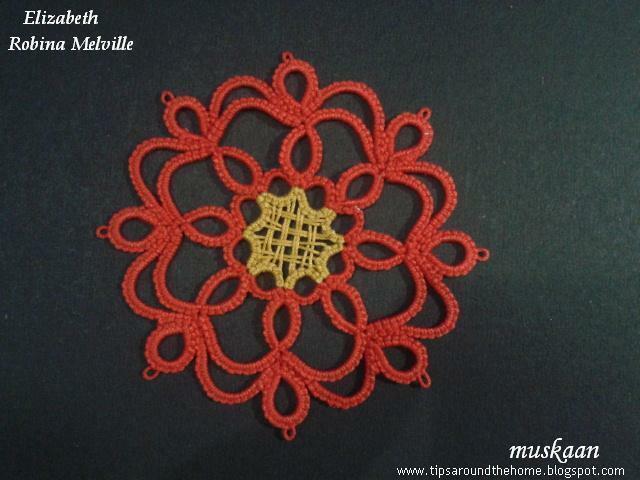 Techniques : directional tatting, long picots, down join, split rings, 2 shuttles. Techniques: directional tatting, long picots (for frayed picots later on), down join, lock join, 2 shuttles (ball & shuttle possible), SCMR to use up ends. Although the pattern did not call for this profusion of picots, I visualized these as flowers & have chosen long picots for a reason. Yes, you guessed it, I want to convert them to Frayed Picots ! After a few repeats I noticed that my fs/bs tatting was ‘wrong’ & I continued in correct sequence, which led to an interesting observation while joining these flowers …. TIP : Using a down join to connect the flowers to previous rounds makes the central picots lift up to the front of the work !!!! (compare with the 2 bottom right flowers in the 6th round pics) are not really visible, but one can get rid of them by tatting the rings RODS. It is cumbersome & time-consuming to separate the strands of embroidery thread. 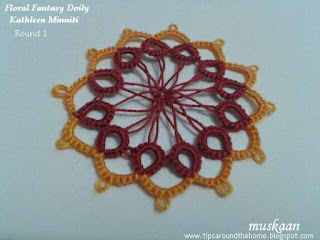 To make full use of the thread in tatting, I used SCMR for many of the rings, thus using up the last lengths of thread. I had first used this in my Wiosna last year (lengthening the functionality of thread & SCMR instead of normal ring). 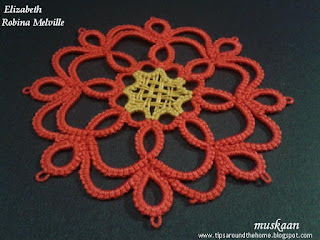 Techniques: directional tatting, down join, ball & shuttle possible. This is a very quick round & I love the overlap of rings at the base of the scallops. Colours are fun to work with, but it takes me so much time to choose them :-( As you can see, I attempted a few combos but snipped them off, ending with a repeat of earlier round colours. Not sure whether I’ve lost the colour plot here, but these were chosen keeping in mind the next round & it’s colours …. 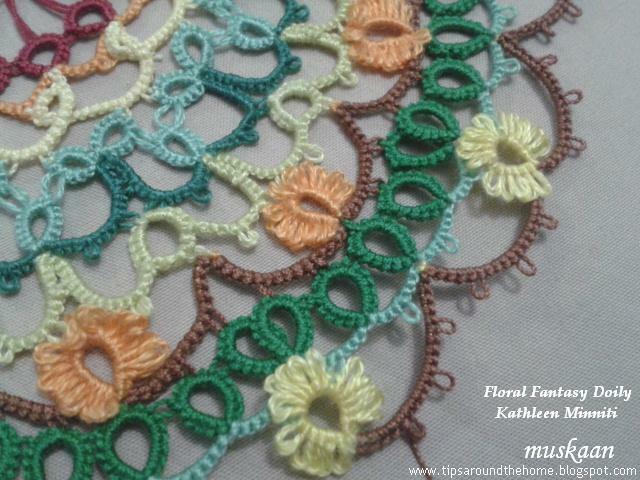 Kathleen is still in the process of developing & writing this pattern & will be sharing it in a proper format soon. I will update accordingly. Related posts : Using SCMR to avoid wasting thread.